There are many types of mathematical competitions throughout the world. Some expect participants to merely state answers, others are multiple choice competitions. Some competitions are oral, and completed in a matter of a couple of hours. Others go on for a week or weeks. Over the past 100 years throughout the world the word "Olympiad " came to mean the particular type of competition where complete essays are expected for every problem and an adequate time is offered to participants. 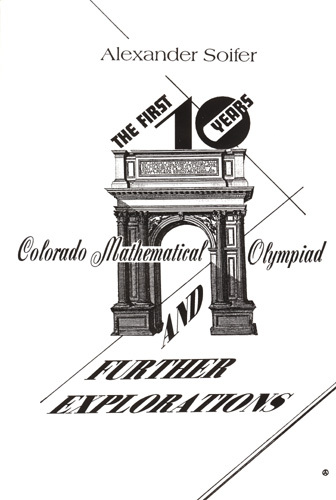 The First Colorado Springs Mathematical Olympiad took place on April 27, 1984. The Colorado Mathematical Olympiad is the largest essay-type mathematical competition in the United States, with 600 to 1,000 participants competing annually for prizes. This book contains the problems and complete solutions for the first ten years of this competition. "I warmly recommend this book to all who are interested in difficult elementary problems." "The book is a gold mine of brilliant reasoning with special emphasis on the power and beauty of coloring proofs." "The mathematics may only be beginning when the contest ends." "The problems alone would make this book rewarding to read. But Colorado Mathematical Olympiad has more than attractive mathematical problems. It has a compelling story involving the lives of those who have been part of this competition." "This is a book of rare mathematical and educational quality." "This book will be a source of delight to all serious problem solvers." "The author takes olympiad problems and shows how their solutions give birth to deeper, more exciting and more general problems." "I hope that it will be translated into many languages, because it is a useful example of a successful transfer of an important cultural phenomenon from one country to another." "Distinguished by personal and conversational style; with historical notes and anecdotes, related conjectures, and open problems." "Who would believe that the history of a mathematics competition could accurately be described by words that more typically appear on the back of a popular novel?" "The explanations of the problems are exceptional."